In linear scar free hair transplantation, (also known as follicular unit extraction), buried grafts are caused when a punch does a partial job of scoring the grafts and then pushes it further down into the skin and subcutaneous layer. This is usually caused by dull punches. Instead of cutting the tissue surrounding the follicle, it pushes the follicular unit deeper into the skin where it becomes lost and can no longer be used. Dr.UPunch™ rotary devices are designed to avoid this problem. 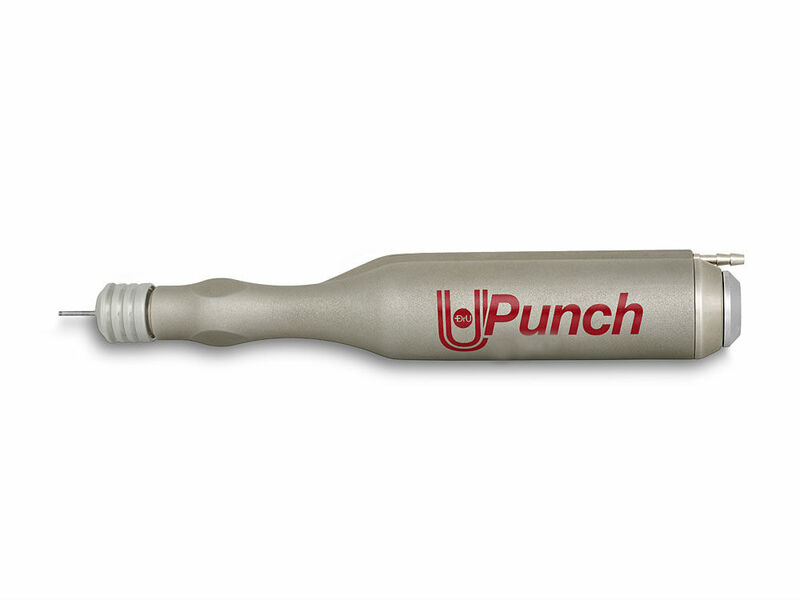 The purpose of dull punches is to keep follicular units safe from injuries caused by sharp cutting edges. However, they are inefficient in completely dissecting the anchoring filaments that attach the follicle to the surrounding tissue. Therefore, they are not always the best tool choice for separating the scored follicle from the rest of the skin. This is why they are likely to produce a higher incidence of FUE buried hair grafts. Graft burial is typically the result of two factors. One is the inaccurate alignment of the dull punch. And the second is the error of pushing partially separated follicles into deeper layers of the skin. At this point, they cannot be retrieved or used. Once lodged past the point of no return, buried hair grafts can lead to unwanted formations such as ingrown hair bumps and even cysts. Hair is likely to continue growing. If it grows back into the skin and the follicle becomes infected, a visible bump can develop. A cyst may also arise if hair grows upward once the wound created at the time of the graft burial actually closes. An empty space which develops above the buried graft and below the closed skin wound. Fluid may later fill this cavity as a final step in forming a cyst. Furthermore, cysts and ingrown hair caused by graft burial can later turn into pus-filled abscesses. 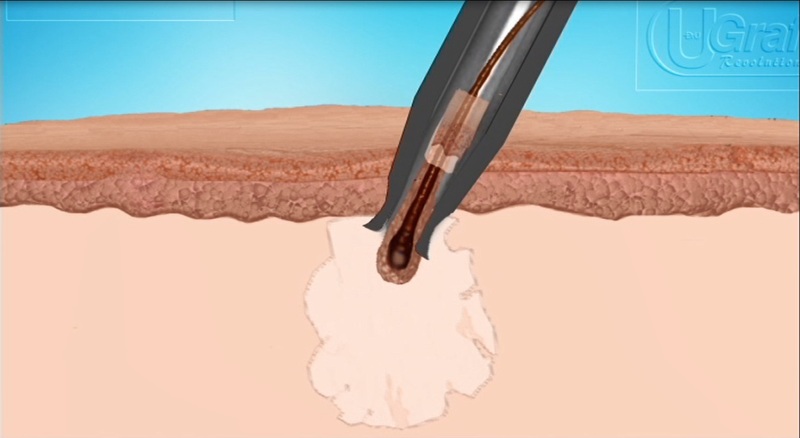 The advanced engineering of Dr.UGraft™ devices avoids the issue of buried hair grafts as well as the complications they cause. This is due to several key components working together. First is the hybrid design of the punch tip which combines a sharp outer cutting edge and a gentle blunt inner wall. Additionally, Dr.UGraft™ technology also includes specialized mechanics that pull the grafts tissue upward. Thus, an upward ascent will eliminate any occurrence of hair follicles becoming pushed downward into deeper layers of the skin, leading to low hair transplant coverage. Watch this video to see this revolutionary scenario eliminate the chance of follicular units being pushed downward and buried. The issue of buried grafts from using a blunt hair transplant punch is avoided using Dr.UGraft devices which pull the follicular unit upward. Here is a specific list of features which work together to achieve these objectives. Dr.UPunch i ™ and the Dr.UPunch Smart™are designed with patent and patent pending design features. These serve to grip and the pull the grafts upward into the punch lumen. The pulling capability is engineered to be balanced in harmony with the cutting of the punch. Without this balance, there would be either excessive pulling or excessive cutting. Too much pulling will completely pluck the hair from the follicle. On the other hand, too much cutting runs the risk of injuring the graft. Successful extraction requires striking the right balance between the two, which Dr.UGraft™ devices achieve. 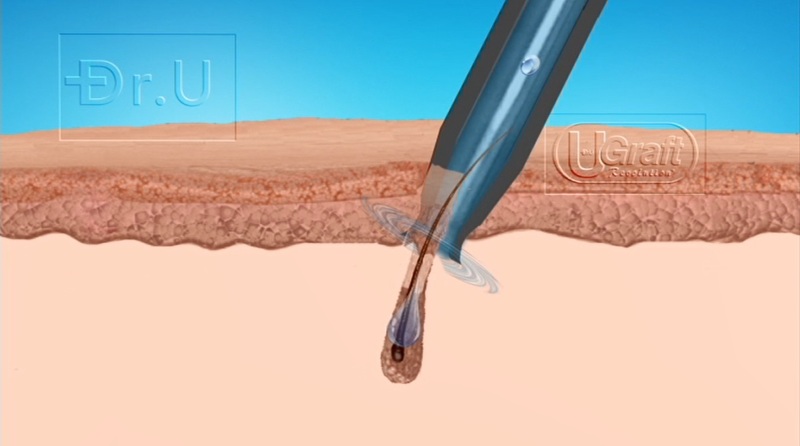 Watch the video below to see the Dr.UGraft ™ rotary punch used during thigh hair extractions. Although these hairs are very sharply angled, this technology is still able to safely pull grafts upward and separate them from their attachments, avoiding burial. The flared, hybrid punch is a first and foremost revolutionary new design concept. Conventionally, practitioners use separate sharp and dull punches. This requires a three-step scoring process. However, Dr.UGraft™ devices make it possible to eliminate this multi-step process by combining sharpness and dullness into a single structure. With a flared design, the dull surface faces and abuts the graft, instead of descending downward upon it. At the same time, the sharp edge cuts entirely away from the follicular unit. A patented upward pulling feature helps to complete the process of separating the follicular unit from its surroundings. Besides keeping the graft safe, this non-threatening surface provides a smooth surface that helps the graft slide upward into the lumen. The sharp and dull capabilities of the hybrid punch free the graft from its anchoring tissue effectively and expediently. This prevents them from becoming buried. And the total separation of the follicular units allows them to practically fly, or pop out from their origins within the deep skin layers. The Dr.UGraft ™ system includes a central computerized console (the Dr.UGraft Revolution™) which operates a fluid irrigation system. This component allows doctors to choose various speeds to control the rate of a slow drip of physiologic chilled fluid as it continuously flows to the punch tip. The fluid serves two main purposes. One is to hydrates the graft during the time of scoring. The other is to lubricate the smooth, dull surface of the punch. This makes it more slippery and easier for the graft to slide upward into the lumen. Dr.UGraft avoids burial and wasted hair grafts through features like the upward pulling mechanic the drip control, fluid system. This hydrates the grafts and lubricates the smooth, dull surface to facilitate the upward ascent into the punch. 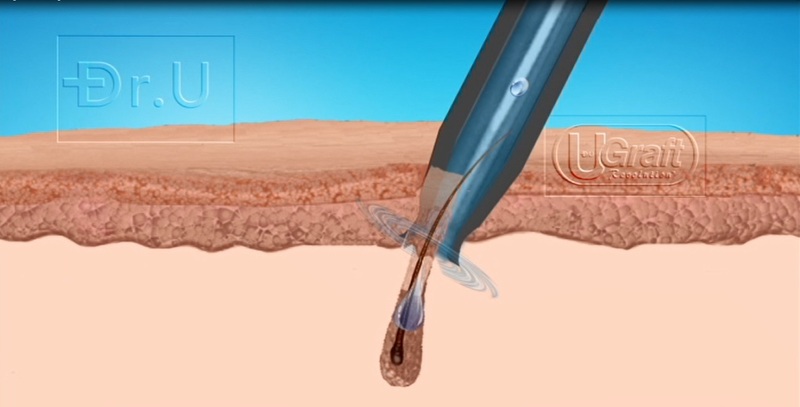 Watch this video to see how the fluid system works as Dr.UGraft ™ punch grips, pulls and scores around the graft. Dr.UGraft ™ features promote upward mobility as grafts are being completely scored. This counteracts any tendency for follicular units to move in a downward direction. In the end, the upward ascent eliminates the risk of becoming buried by the punch. The Dr.UPunch i ™ device is constructed with an expanded interior. Increasing the volume of this punch affords more room to accommodate follicular unit grafts, whether they include single or multiple follicles. This feature is important for their ability to be successfully pulled upward into the punch lumen. On the other hand, if not enough space is available for the grafts, they are more likely to remain in their original location (as opposed to ascending). Under these circumstances, they face a much higher risk of becoming pushed downward and buried by the punch end. The Dr.UGraft ™ rotary punches achieve greater, more spacious inner volume by reducing the external diameter by 1-3mm. Since the Dr.UGraft™ flared tip gathers more of the enveloping skin around the follicle, it creates grafts with greater tissue bulk. More space then becomes necessary to comfortably accommodate these follicular groupings inside the lumen. Dr.UGraft™ achieves this by reducing the external diameter of the punch wall to expand the inner volume of the punch. Creating more room lowers the resistance gradient to house the bulkier graft. In other words, the patented upward pull requires enough room in the lumen for the graft to move into. Once the graft ascends successfully into the interior, there is no way for it to become buried deeper in the skin. The problem of buried grafts is primarily caused by mistakes made with conventional dull punches. But the answer is not to get rid of the dull punch altogether. Instead, Dr.UGraft ™ devices show that it is possible to reimagine and improve upon the general concept of the blunt punch. This is achieved through the groundbreaking design of the proprietary flared, hybrid punch tip. Coupled with the ability to pull graft tissue upwards, Dr.UGraft™ rotary punch devices are built to prevent the issue of FUE graft burial. Overcoming limiting factors like these which reduce the donor hair transplant graft count ultimately helps patients avoid unwanted outcomes such as low hair transplant coverage. Dr.UGraft™ devices are built with a myriad of astute features designed to solve the foremost problems that contribute to buried damaged, unusable hair transplant grafts. Watch the video below to see this technology in action during a real-life surgery performed on a patient’s chest. Besides graft burial, what are other mistakes that lead to wasted, unusable hair transplant grafts? In addition to buried grafts from Follicular Unit Extraction, other types of errors that contribute to wasted hair transplant grafts include air drying, misaligned punches, and torsion-based injuries. Once a graft is damaged and rendered unusable, new follicular units will not grow in.